A delicious creamy soup made of our home grown artichoke harvest. Enough made to last the whole weekend. But within a short space of digestion time after the first and second helpings we knew that it was unlikely we would want to grow this much of the vegetable again. The 'fartichoke' vegetable had taken two more victims. The composting toilet in the cottage was bypassed for the more airy outdoor facility, which was frequently visited over the following 24 hours. It was a horrible but necessary duty to dispose the Sunday helping of the soup onto the compost patch, not a drop more was to pass our lips. But whilst our compost patch will appreciate the latest addition to it's bulk, it's fair to say that the unusually warm and snow-less winter is helping its decomposing rate too. 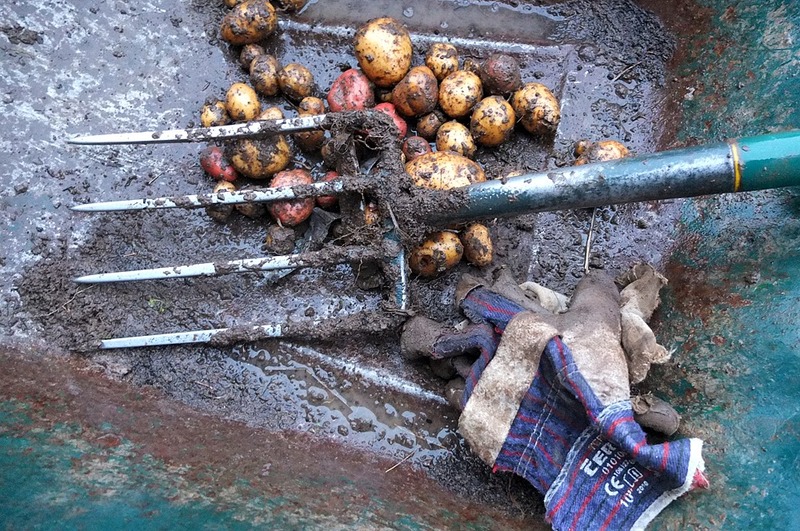 Currently more chores are taking place outside than in, such as weeding and finding a potato supply to last week. A multitude of tasks can be undertaken in such pleasant conditions which has led us to believe that someone upstairs is telling us "to get a move on, you were supposed to do all this back in Autumn, I can't hold back this snow for too much longer!"